Our client in this case was the mother of the only child of marriage. Our child custody law firm took the case that started in 2009 with the mother filing a Petition for custody and support of a child against the father where the parties reached a stipulation and order awarding the mother sole legal and sole physical custody. Later on the mother filed a divorce case and since the father failed to respond, the mother entered his default in 2010. The divorce case was consolidated with the paternity case. In early 2012, the mother and without notifying the father moved to another State. The father filed a police report and hired a very aggressive Orange County Family Law attorney who filed an emergency motion with the court (ex parte application) and obtained custody for the father and appointed a child custody investigator. The mother was arrested on a DUI despite the fact that her car was parked and she was not driving; the police justified the DUI charge as they found an open container in the car. The child custody investigation report, based on the mother’s DUI conviction and the fact that she moved away without notifying the father, came to the conclusion that the mother should only have supervised visitation with the child and that father should have sole legal and sole physical custody of the minor child. The matter was further complicated by the mother agreeing to “bifurcate” the trial on the custody and visitation issues and the trial was set for the second half of 2013. The mother decided to retain Sarieh Law Offices to help her litigate the child custody during the bifurcated trial. 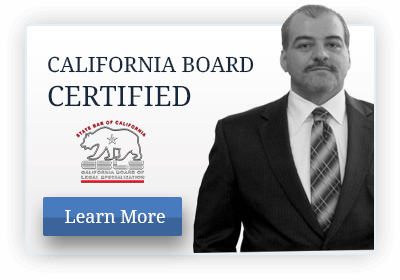 Mr. Sarieh, an Orange County Certified Family Law Specialist challenged the entire proceedings from 2010 to 2013. Mr. Sarieh argued that every document filed including but not limited to the child investigation report and every court order rendered after the entry of default in 2010 is null and void. Our firm was very proud of the results and very proud of our judicial officers. The judge agreed with Mr. Sarieh that the court has no jurisdiction since the default was entered in 2010. The trial by default was set in month and our client obtained a dissolution judgment awarding her sole legal and sole physical custody of the minor child. Our client in this case was the father of two children; the parties were not married but cohabited together for over a decade. Throughout their cohabitation both parties worked hard to support their children; the parties lived in an upper-middle class life style during their cohabitation. Shortly after their separation, the mother claimed disability due to Reactive Airway Disease (RAD) she quit her job as mortgage broker, collected State Disability checks and filed Worker’s Compensation claim alleging her disability resulted from the poor air quality at her office. Mr. Sarieh, an Orange County Certified Family Law Attorney, filed with the court a request to vocationally evaluate the mother. Unfortunately the vocational evaluation report concluded that the mother is employable but her employability depended on her health condition, which was beyond the vocational evaluator expertise. In a trial that spanned over the period of months, Mr. Sarieh was able to successfully cross-examine Petitioner’s primary care physician who came to testify on her behalf. The physician admitted that his patient; the mother is able to work under certain conditions. Mr. Sarieh subpoenaed all medical reports from the Worker’s Compensation case and was able to establish the mother’s ability to work. The Court agreed with Mr. Sarieh and stated that the mother has the obligation to support the children; the court imputed income to the mother and the child support was calculated according to the mother’s imputed income even though she was still not working at the time of trial. Our client in this case was the husband, who with the wife’s agreement entered into a stipulated judgment awarding the family residence to the wife; neither party was represented and they entered the judgment with the assistance of a paralegal in Orange County. The parties were married for long time and have adult children from their marriage. The untold story was despite the written judgment; the parties had verbally agreed that once the house is sold the wife will give the husband his fair share of the proceeds. Of course, wife sold the house and refused to pay husband any monies. The husband sought the assistance of Sarieh Law Offices; Orange County Divorce attorneys. We began our investigation by examining the judgment, which stated unequivocally that wife gets the house. We were also faced with the legal hurdle that it is almost impossible to set aside a judgment in California if the judgment only dealt with property division and without fraud, duress or undue influence. We noticed on the Resister of Action on the Court’s website that the initial submission of judgment was rejected by the court and that the judgment was returned. The judgment was re-submitted again and the court accepted it. We asked our client whether he knew anything about the rejection of the judgment and he indicated that he knew nothing about this rejection. We asked for a copy of the entire file from the court itself and we did not rely only on what our client gave us. We set the wife’s deposition at our office. We received the ordered copy of the court’s file on the morning of the wife’s scheduled deposition at our office. After a careful examination of the court’s file with our client, we found out the signature on our client’s Declaration re: Service of Declaration of Disclosure was not his. We confronted the wife during her deposition about the falsified document but she denied any involvement and blamed the paralegal. She acknowledged that the document was not signed by our client. We subpoenaed the paralegal to the court’s hearing to prove the wife’s fraud and we retained a handwriting expert to prove that our client’s signature was falsified by the wife herself and no one else. Right before we entered the court room to try our case, the wife’s attorney approached us with a settlement offer giving our client what he was promised. Our client accepted the offer for the sake of the parties’ adult children.